It is truly amazing how much having a pet can effect your life in a positive way! Pets can overall reduce stress, increase your fitness level, improve your health and initially make you a lot happier. However, with all of these positive things comes the other contributions your pets leave behind including urine stains on the carpet, fur clinging everything you can imagine, or even the occasional hairball. Cleaning the carpet is usually going to be a necessity sooner rather than later when it comes to most animals. Carpet and the right cleaner! 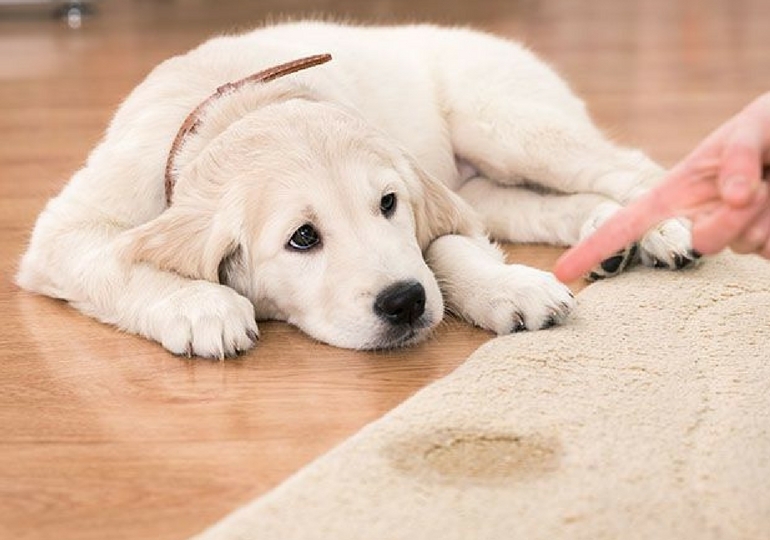 There’s a lot of bad advice online about how to clean your pet’s urine spots on your carpet. Some internet sources will tell you to just throw some paper towel down and then basically try to absorb the liquid all up by stepping down on it. However, that is probably the worst thing you can do. Most carpets are really absorbent, but much of the absorbing occurs below the rug and in the padding below it. So when you think you are soaking up this liquid mess by stomping on it you are actually stomping it further into the pad below. The most efficient way to clean up would be by purchasing a tool that can extract fluid from rugs, like a handheld extractor, a floor cleaner with an extract-only mode, or even using a wet/dry vac to do the trick. All of these tools are far more effective than using paper towels to try and get the job done. Use one of the tools mentioned above to pull as much fluid as possible out of the carpet and pad. Remember that the small spot on top of the carpet may be hiding a much larger spot that’s locked in the pad. Keep extracting in a wide arc until nothing else comes out. Treat your carpet with a bio-enzymatic cleaner. Don’t use a carpet cleaner first or you may lock any stains into the carpet permanently. If a spot remains, use a stain remover to help break it up after the bio-enzymatic cleaners are done doing their job! Wrap masking tape around an old paint roller attached to a broom handle. This trick will leave you what is literally just a giant lint roller! The tape will help you get the hair off of the surface of the carpet! However, you should probably still vacuum afterwards! Purchase a high powered, pet-focused vacuum with a HEPA filter. This is probably the best general purpose tool you can get for dealing with hair in carpet. You’ll need to vacuum a few times a week to keep ahead of all the hair lost.